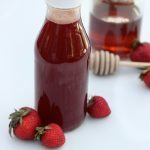 Homemade simple syrups have become a staple in my kitchen, much like homemade nut milks, nut butters and even sprouts. It’s a simple treat that you can easily make with your favorite fruits, herbs and/or botanicals. Occasionally, I will make them with organic raw sugar, but since I really adore the lovely the depth of flavor that you get when you use good local raw honey, I usually opt for that instead. The possibilities are really endless for flavors, you can experiment with whatever you like best and expand your flavors and combinations from there. This particular flavor combination is one of my absolute favorites. 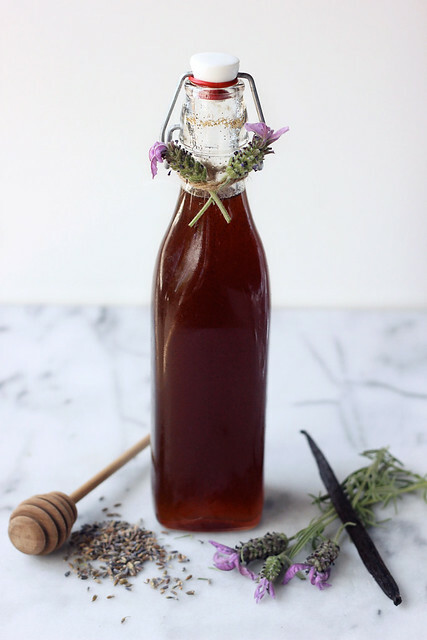 Lavender and vanilla bean together are what dreams are made of, add in the honey and just forget it. It really doesn’t get any better. Sweet, fragrant, earthy and unique. A few teaspoons of this syrup is wonderful topped with sparkling water for a refreshing non-alcoholic beverage. You can also use it as a traditional syrup, pouring it over yogurt or ice cream, cereals and granolas you can even add it to a homemade almond milk latte, which I am telling you – is life changing!! I am kind of obsessed. 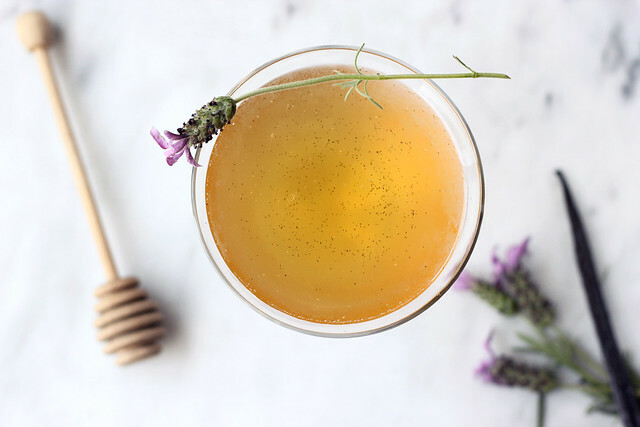 I am sharing the recipe for this delightfully fragrant Honey Lavender Vanilla Bean Simple Syrup over on the Free People blog BLDG 25 today, but do make sure you come back here to make this deliciously simple and unique martini, once your syrup has cooled and you are ready to get creative with it. Though I tend to prefer to go the non-alcoholic route with a little sparkling water, I do like to imbibe now and again with a special cocktail and one just like this is exactly how I like to roll. 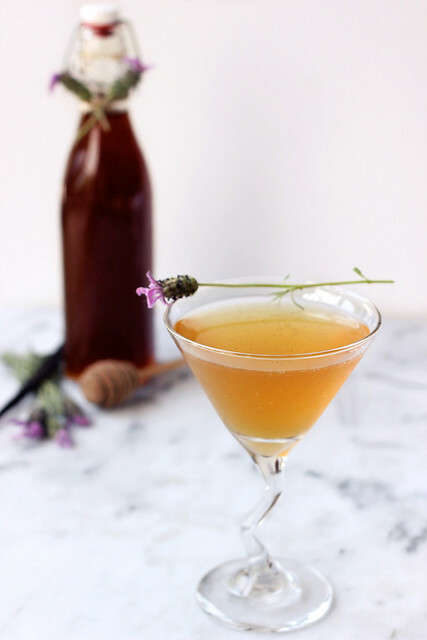 This martini is one of my favorite ways to enjoy this syrup, since it is all about just that. Use your favorite gin or even vodka, if that’s your preference. 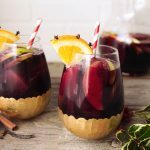 It is elegant and aromatic and such a special treat for a cocktail party, a backyard BBQ or even a random weeknight when you want to treat yourself a little. 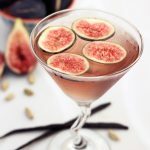 Of course, you can also create a slew of other various cocktails with this simple syrup, so have fun with it. Try adding it to some chilled Prosecco or maybe use a little to muddle with some fresh mixed berries for a super special mojito type drink. 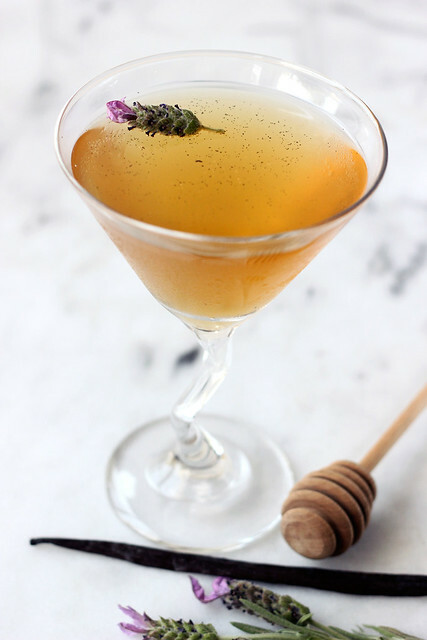 Fill cocktail shaker with the gin and honey lavender vanilla bean simple syrup and a handful of ice. Shake. Strain into a chilled martini glass. Top with sparkling water. WOW! Although I don’t drink this looks and sounds so tasty! Thanks for sharing your beautiful recipe and photo’ always such a treat! Thanks so much Kathy, I don’t do much drinking these days, so I can tell you this simple syrup is just as good simply with some sparkling water. Such a nice treat. Hello, yum! I totally came to check this out from Free People, and I am not disappointed. Can’t wait to make this cocktail, and about a thousand others. Thank you! Thanks so much Liz. So glad you came over and I hope you enjoy this cocktail, if you make it. Thanks again. 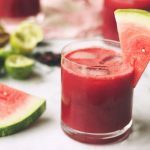 This is the PERFECT summer brunch elixir – LOVE THIS! !